"Multicultural Intelligence 2nd Edition by David R. Morse"
When the first edition of this book was released in 2009, America had just elected its first truly multicultural President and some, either optimistically or naiively proclaimed that the nation had become a "post-racial" society. With a father from Kenya and a mother from Kansas, raised in Hawaii with an Asian sister, Barack Obama referred to himself as a "mutt" at his first press conference. It can easily be argued that the 44th President is, at least demographically, much more like the future of the US than its past. Eight years later as this second editon is being released, the nation has elected Donald Trump the anti-Obama who has made nationalism a central plank of his agenda. For many of his supporters, the term "Make America Great Again" harkens back to a simpler time like the 1950s when whites were much more dominant than they are now. Even if the term melting pot applied 100 years ago, it doesn't fit today. Some demographers and social historians have adopted a new phrase "the salad bowl" to describe a united nation of peoples who bump into each other and share the same space and laws, but retain what makes them "special" and prefer not to blend in, at least not too much. What do these developments say about the future of multicultural marketing? Will the nation fracture into disconnected communities with no shared commonalities? Or will we be a pluralistic society with some core values and limited interaction between groups. No one can say for sure what we will look like 50 years down the road, but it's safe to say that race will still be an issue and marketing will never be the same. Marketers, at a minimum, must try to understand what each new wrinkle in the fabric of society means for products, our brands and our companies. If we get it right and are able to crack the code on issues like assimilation and ethnic identity, we stand to make a lot of money. If we miss it, we risk becoming as meaningless as the buggy manufacturers of yesteryear. 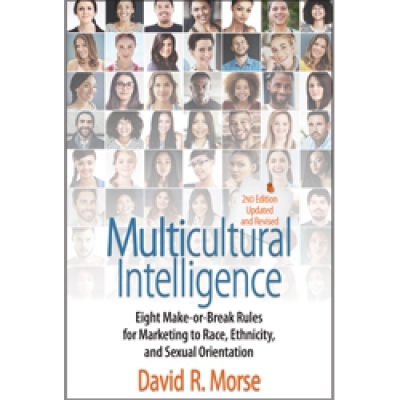 With decades of experience in multicultural marketing, author David Morse reviews the history of marketing to black, Hispanic, Asian, and LGBTQ consumers. He explains how including appropriate cultural cues in advertising can build brand loyalty that will pay huge dividends. He also cautions that missing the mark with advertising that excludes or is culturally offensive can be a costly mistake. Replete with scores of examples of campaigns that have been extremely effective, as well as those that have sparked outrage and boycotts, this book provides EIGHT basic rules that should guide you through the process of marketing as diversity becomes mainstream. Recommended, for all levels of management and any student of marketing or advertising.